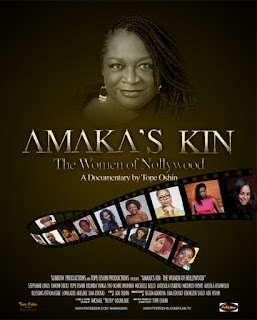 Dedicated to the memory of Nollywood Amazon Filmmaker Amaka Igwe (1963-2014), Amaka's Kin chronicles the journey and challenges of the very few female Directors working in the Nigerian motion picture industry popularly known as Nollywood. In a terrain otherwise tagged as "for men", Amaka's Kin seeks to examines the careers of the very few female directors practicing in the very male dominated Nigerian film industry, widely known as Nollywood; their journey and pain, their joys and the challenges and hurdles they had to jump to become directors of film, and by extension celebrates the success of the career of the most prominent female director of film, the late Amaka Igwe, who was pivotal to the growth and development of Nollywood and indeed an inspiration to The Women of Nollywood. Tope Oshin who has been named one of Africa's Leading Women, Nigeria's Most Inspiring Women, and on the Top 7 Power Women in Nigerian Film, is a multiple award-winning motion picture professional who studied Theatre Arts, T.V & Film Production from the Lagos State University, Nigeria, and then Filmmaking at Colorado Film School, USA, and also an alumni of Berlinale Talents and Talents Durban. She directed 350 episodes of Africa's biggest daily soap opera Tinsel and 96 episodes of popular African tele-novella Hotel Majestic. Other credits are multiple award winning films, and soon-to-be-released documentary Amaka’s Kin. Among her producing credits are 26 made-for-TV movies, talk shows, the soap opera - Tinsel (as Box/Content Producer) and 2015 BFI premiered theatrical feature Fifty directed by Biyi Bandele, amongst others. She has also cast several projects and notable among them are MTV Europe’s drama series Shuga 3 & 4. Within her experience as Supervising Producer and Production Consultant, she has accepted and reviewed over 40 screenplays from writers and filmmakers in readiness for production. Also consulted on and supervised the production of over 25 TV film productions, working with over 26 young filmmakers to develop their projects from concept to final cut; and also lent her voice and skill as a facilitator at several film and storytelling workshops in Nigeria. Tope, who has served as Juror for the International Emmy Awards 2015, Eko International Film Festival 2015, and the AMVCA (Africa Magic Viewers Choice Awards) 2016, has been featured on CNN twice; on CNN'S INSIDE AFRICA and CNN.COM, and also on German TV, DW Deutshe Welle TV while attending Berlinale 2015. Currently working underground developing her next film and tv projects, Tope is open to international collaborations and partnerships.